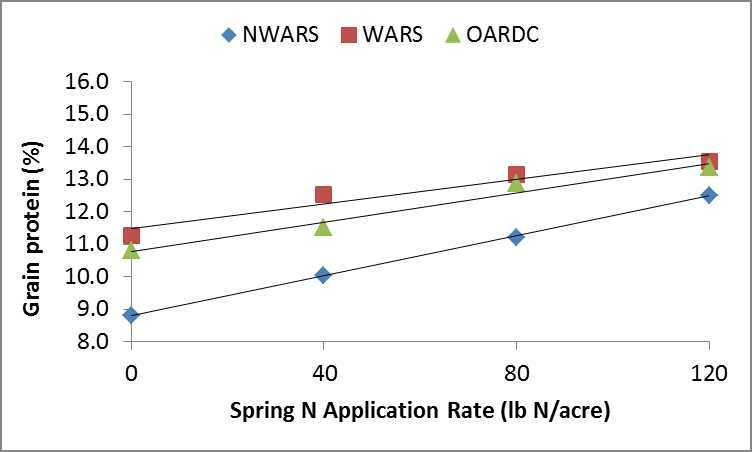 Summary of Nitrogen Rate Results: We evaluated the effect of four spring N application rates: 0, 40, 80, and 120 lb N/acre. (Each field received approximately 20 lb N/acre in the fall and cultivar ‘Puffin’ was planted.) Nitrogen was applied at Feekes 5 growth stage. The agronomic optimum N rate (N rate where grain yield was greatest) ranged from 100-119 lb N/acre depending on the location. However, protein content of the grain is extremely important, which is influenced by N application rate. For the malting industry, grain protein should be 9.5-12.5% on a dry weight basis. In our trials, grain protein content increased with increasing N application rate. 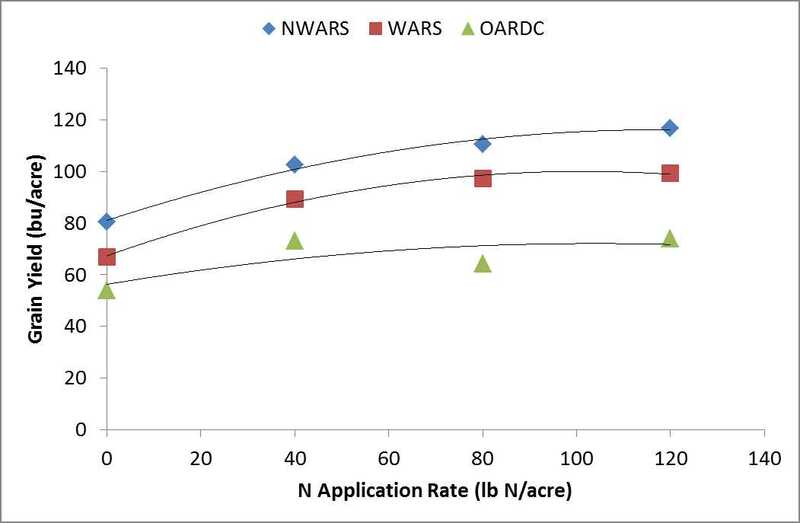 At the Wood County location (NWARS), average grain protein was ≤ 12.5% regardless of spring N application rate. At the Clark County (WARS) and Wayne County location (OARDC), average grain protein content exceeded 12.5% when 80 lb N/acre or more was applied. Summary of Seeding Rate Results: We evaluated the effect of five seeding rates: 0.75, 1.0, 1.5, 2.0, and 2.5 million seeds/acre on the cultivar ‘Puffin.’ Barley was planted Sept. 29, Oct. 7, and Oct. 19 at the Northwest Agricultural Research Station (NWARS) in Wood County, the Ohio Agricultural Research and Development Center (OARDC) in Wayne County, and Western Agricultural Research Station (WARS) in Clark County, respectively. Overall, there was a poor relationship between seeding rate and grain yield. However, the agronomic optimum seeding rate (seeding rate where grain yield was greatest) was 1.6-1.8 million seeds/acre. Barley should be planted based on the number of seeds/acre. Planting by pounds/acre or bushels/acre is inaccurate due to variability in seed size. Keep in mind, barley seed is often large (fewer seeds per pound). In our trials, ‘Puffin’ had ~10,000 seeds/pound. This research was funded by the Ohio Small Grains Marketing Program.